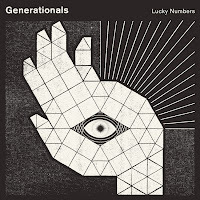 A new track from Generationals who will be releasing a brand new EP Lucky Numbers in October. The title track is all about the synthesizer, it has a great 80's feel about it and you can't help but smile in happiness. It doesn't even matter that this song has lyrics, when a song is this much fun all you do is enjoy the ride. So as the weekend approaches, I hope that this song puts you in the right mood for it!